Get the most out of your bachelor’s degree in journalism or communications. Check out the best undergraduate communication and journalism school rankings by salary. The ability to communicate clearly and accurately is a key skill in any professional field, but how do communication and journalism majors stack up in terms of pay? If you want to study communication or journalism, you’d be well served to pick a school where students with these majors go on to earn high salaries. PayScale can help you identify those schools with our College Salary Report. 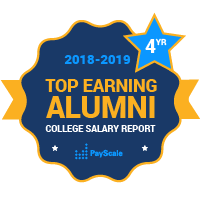 PayScale has median salary data for communication and journalism majors from scores of colleges and universities. Perennially good schools for communications and journalism majors hoping to earn top dollar for their skills include the University of Southern California, New York University, Northwestern University, and the University of Michigan at Ann Arbor. Colleges in big cities are a good bet for communication and journalism majors, as their proximity to big media outlets and companies will increase students’ chances of getting internships and jobs instead of ending up on local news in a small-town market.